The difference between the perfect business suit and one that is merely adequate can mean the difference between a strong first impression and one that is instantly forgettable. Too many men settle for suits that are not quite the shade or pattern they had in mind, or buy shirts knowing that the collar is just a bit too loose, and the sleeves a touch too short. The perfect suit is not one in which every stitch is evenly spaced—that can be found in virtually any mass-produced garment. The perfect suit is one that satisfies on all levels and affords its owner a sense of confidence and well-being. Finding the perfect suit can seem like a daunting process, which is why many people don’t bother. However, it can be a fascinating journey during which you will encounter traditional craftsmanship, and discover your own sense of style as well as taking the average customer into the world of bespoke tailoring. For those new to bespoke tailoring, starting with a custom order shirt is a good idea as they are relatively quick to make, and the difference in fit and styling between a tailored shirt and the off-the-rack equivalent is instantly recognizable. K’s Papa is a gem of a shop hidden on a small side street just off Omotesando’s Kotto Dori. 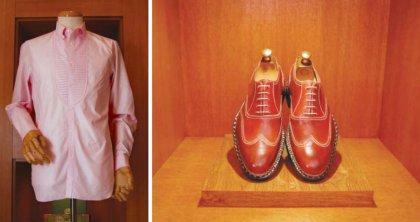 Visitors are greeted by Keizo Takahashi, the owner and sole tailor. Takahashi will guide you through his stock of hundreds of bolts of material in every imaginable color, pattern, and texture. Having selected a material with the look and feel that is just right for you, next comes a choice of dozens of available cuff and collar styles. Now it is time for Takahashi to take your measurements, which he does with quick, deft movements of his tape measure. One might assume that a custom-order shirt can be made from a simple collar and sleeve measurement, as that is how ready-made shirts are selected. However, Takahashi also takes waist and hip measurements, crucial for a contoured fit that prevents bunching up above the waist, which is the first sign of a bad shirt. After deciding on options such as buttons and monogrammed cuffs, the rest is up to Takahashi. Roughly 20 days later, you will receive a call letting you know your perfect-fit shirt is ready. A basic shirt costs a mere ¥9,000, which is less than many ready-made models, leaving you with absolutely no reason to continue buying ill-fitting shirts. 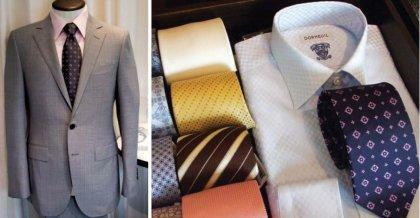 On the quest for the perfect suit, the importance of selecting good materials cannot be taken lightly. The quality of the material used not only determines the look and feel of the suit, but also the way that it drapes from the body and reacts to movement. 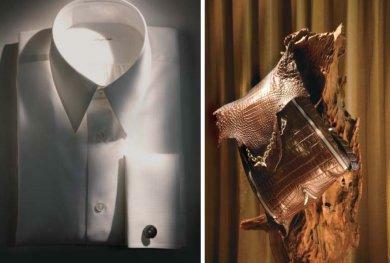 For these reasons, it is worthwhile to go directly to the source with Dormeuil. Since 1842, the Dormeuil family has been the supplier of materials sought after by tailors from London to Hong Kong. The Dormeuil shop, near Aoyama-Itchome station in Tokyo, is the only one of its kind in the world, offering custom-order suits and shirts made from specially selected material. There are three basic suit styles, or a full bespoke model for those wishing to customize collar styles and other details. The customer can then select from over 3,000 available materials in the Dormeuil collection. This may seem like quite a task, but the store is fully stocked with sample books neatly categorized into lines such as “Amadeus” for winter, “Essential” for all seasons, and “Tropical Amadeus” for spring/summer. A new line, ‘Drytwist,’ a lightweight, breathable pure wool, was designed especially for the heat and humidity of a Japanese summer. After selecting linings and buttons, the order is complete. Material is sent over from Dormeuil’s headquarters in France, and your suit is constructed in Japan in around one month. Prices start at ¥150,000-¥180,000 for a basic suit, and can go as high as ¥3 million for a suit made from luxury Pashmina and worsted vicuna. If you would like something made to even more exacting specifications, you should seek out Icho, a shop on a quiet back street of Omotesando run by designer Toru Icho. A native of Kyoto, Icho is a firm believer in traditional Japanese craftsmanship and quality. When Icho cannot find a fabric that meets his needs and high standards, he works with craftsmen all over Japan to weave it on traditional looms. Each garment begins life as a sketch on paper, from which a paper pattern is made, and from that a prototype made of linen. The customer returns for a fitting with the prototype, which is marked for minor adjustments, and the final piece is created. It is a process that can take as long as one month, but the result is a truly one-of-a-kind piece of impeccable quality. Jackets are priced starting at ¥180,000, and trousers begin at ¥80,000. Icho also has a partnership with Bologna shoemakers Peron & Peron, one of the few remaining workshops in Italy to produce shoes in a completely traditional handmade process. Simone Peron visits Japan twice a year, setting up in Icho’s shop to take orders. A pair of Peron & Peron shoes means a wait of around six months, and a price tag ¥400,000 or more, but they are known to last for a decade or even longer. If you are looking for a bit of a jazzy, more than a business look, you might want to try Cool Struttin' They used to be just off Kotto-dori, but have recently moved to Ebisu. They do great order made suits and have some offbeat fabrics.